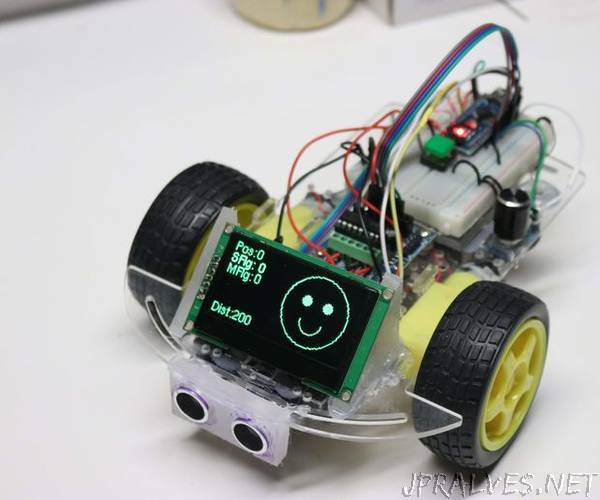 “This guide will show you how to create a low-cost ($39) collision avoidance robot with a face on the font. We do this by using a new low-cost, bright OLED display. Our students love to add faces to their robots. They like to draw smiley faces that change based on what the robot is doing. They are very bright and have high contrast. Even a bright room they are easy to read from many angles. They have good resolution. The ones I am using are 168x64 pixels. This is almost 4x the prior displays we have used. They are low-power and they work consistently even when your robot’s power is dropping. They are relatively low cost (around $16 each) and the prices are dropping.